If you own the Sourin iShare, this pack of replacement cartridges is going to be an absolute must have! Vaping is such a fantastic way to overcome cigarette cravings, skip out on a bunch of extra unwanted calories and enjoy the flavors that you love in the easiest and most convenient way possible. The iShare device is so sleek, compact and functional that it really lends itself perfectly to on the go discreet use that will let you indulge yourself all of the time, no matter where you happen to find yourself. Anyone who has been vaping for even a short time will know just how amazing of a hobby that this can be, it's like a whole new world opens up to you and you can finally live life with that carefree, indulgent feeling that you have always wanted to be able to have. With the production of this three pack of refillable replacement pods for your vape pen, you are now going to be able to open yourself up to the joys that come from all of the different vape juice options that are out there for your enjoyment. Variety really is the spice of life and now you can experience all of the wonderful flavors that you crave for the ultimate amount of excitement in your day to day routine. Each of these pods is able to hold 0.9ml of the liquid of your choice and has been designed with an easy to install magnetic connector that will have you loading these in completely trouble-free. 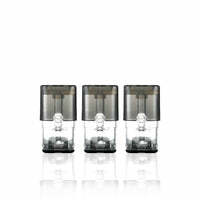 iShare Replacement Cartridges (3 Pack) - Suorin has a rating of 4.0 stars based on 7 reviews.